Learn what's working now to build your brand, authority, and credibility on Instagram in 2019. You may be unsure of how well your lead magnet is working now. You look at the bigwigs and influencers in your niche that say they have thousands on their lists, and you wonder how they got there. They must be adding more than just a few folks each week, right? And it’s true, they are! 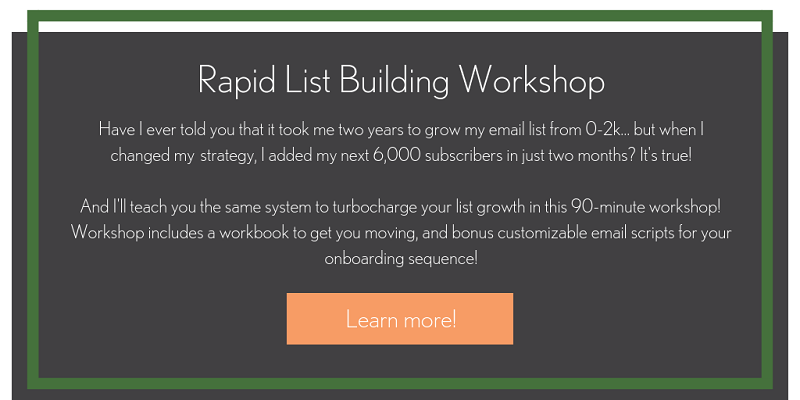 Over the next few weeks, I am going to teach you a system for growing your email list by leaps and bounds, just like influencers. The first step is an enticing lead magnet. In this article, I am going to show you how to create a lead magnet that cuts through the clutter. You are likely not alone in your niche. So how do you rise above the noise and get your ideal customer to request your lead magnet and subscribe to your list over everyone else’s? If you’ve been trying to nail the perfect topic for a lead magnet, you’ve likely done your research and gotten a lot of similar advice. My hope is that this article provides a deeper framework for implementing the common advice about how to create a lead magnet. Your lead magnet should be a small portion of the final product that you wish to sell. 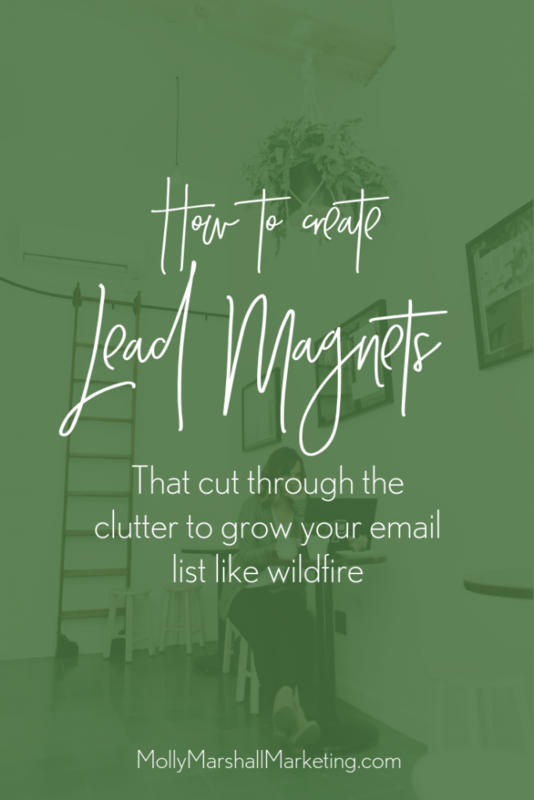 It’s probably not that difficult to come up with many lead magnet ideas that are related-ish to what you want to sell more of. However, the ideal lead magnet topic isn’t only related to what you want to finally sell, it is a logical first step. Imagine a rushing river, that has a series of rocks jutting out of the surface like a natural path across. You wouldn’t jump to the 4th or 5th rock. That sounds dangerous! You would start with the very first one. This is your lead magnet. Maybe the best way to hit this home is to give a few poor examples. While building traffic to my new website is certainly on my mind, that isn’t even something for me to worry about right now. Driving traffic is a problem that I need to solve after the website is built. If the core offer is a website design package, a better lead magnet would be one that subtly helps me to choose this company or individual as my web designer. Let’s say that you aren’t selling a service, but a physical product. One of the simplest lead magnets you can offer is some kind of discount. I love this example from Bitsbox, which I actually took advantage of around the holidays. The discount (ok, and reading reviews) helped me overcome any reservations I had about trying their product. What would someone want or need to know before hiring me or buying from me? What are the most frequently asked questions I get about my products or services? What re the most frequently asked questions about my area of expertise? What ways can I demonstrate my knowledge and expertise to build trust? Take a few moments to jot down your initial thoughts regarding these questions. A great lead magnet “flips a switch” for people and creates some kind of change or transformation. I feel that a lot of entrepreneurs get tripped up here, because they assume the transformation needs to be something monumental. Transformations come in so many different shapes and sizes, but here are a few ideas to help you get creative. Educational or Intellectual: I have more knowledge about this subject than I did before I consumed the lead magnet. I have a piece of information that can help me make some change or decision. Physical: There is something different about my body now because of this lead magnet. Maybe it is more energy, less weight, more focus, less brain fog, etc. Emotional: I feel different now because of this lead magnet. Someone could feel more confident, or supported/less alone, more positive, etc. Business: I am growing my business or moving my business in the right direction because of this. Relationships: I can make a change or show up differently in a relationship (marital, parental, professional, etc.) now because of the information in this lead magnet. Inspiration or Creativity: I have so many new ideas because of the prompts or inspiration in this lead magnet. Decisions: This lead magnet walks me through the steps I need to take to select something to decide on something. I’m sure there are many, many more categories of transformations, but I share these to help you shed the belief that you need to help someone go from 0 to perfect with your lead magnet. You don’t, you just need to show them that you can help them step on the right path. Let’s review our earlier example of web design service, and the lead magnet that contained a list of questions for a prospective customer to ask a potential web designer. This checklist solves a problem for the customer because they may be overwhelmed by the process of hiring a web professional, or may have zero experience with building a website, and have no clue what to ask. This immediately gives the potential customer a boost of confidence in their decision-making ability. If they doubted what they were getting into before with hiring a web designer, by scanning the question list they can wrap their heads around it a bit more. In this case, the transformation is increased confidence. The last thing you want is for someone to open your lead magnet, feel overwhelmed by too much information or the perception that there is too much work to do, and set it aside… forever. When someone opens up that lead magnet or gets inside it for the first time, you want them to get a good sense of what value you are offering by just scanning. They don’t need to be able to completely read the lead magnet or take complete action on it in 15 minutes, but they should understand the value. A large part of this is formatting and overall length. If your lead magnet is a PDF, this isn’t about the number of pages it is. This is more about how the information is structured. Can someone flip through and see the headings, sub-headings and illustrations and quickly understand what they are getting? If your lead magnet is a video or audio file, you should hit them quickly with the benefits of the information to come (and then deliver on that) so that they understand the content in the rest of the video. I wanted to share this example from Fender, because at first glance you might think that it defies the “simple to consume” rule. Fender is offering a free trial of their Fender Play service. It’s a platform that helps teach you to play guitar. That is a huge promise, and likely has tons of content. However, the trial is limited time, and I’m sure that once inside, the content is broken down in to lessons, modules or genres so it is easy to pick just one thing to get started. Good production quality can really help boost the perceived value of the lead magnet to the consumer. While this is shallow, and not always true (because there is a lot of really ugly content out there that is of good substance! ), it is a reality. And a really simple fix! Making your lead magnet look nice doesn’t mean it has to be fancy. Simply pay attention to formatting. 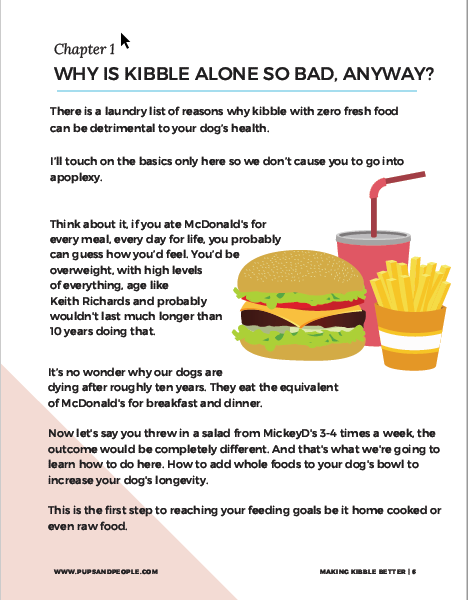 I love this example of Nikki’s “Making Kibble Better” guide from pupsandpeople.com. For video, you don’t need millions of snazzy animations, but make sure people can clearly see and hear you. The great news is that appealing design is available to anyone these days with tools like Canva.com. There are tons of templates to choose from on Canva. You don’t even have to come up with layout ideas yourself! If you feel that formatting your lead magnet is really beyond your capabilities, you can find inexpensive help on sites like Fiverr.com (which I have not personally used) or Upwork.com. There is no one-size-fits-all approach here. Some lead magnets defy all the rules, and still work really well. One example is my own, my 2019 Instagram Strategy Guide. A strategy guide is a fairly broad topic, and the promise of transformation really isn’t crystal clear. However, it has worked very well for me and has outperformed any other lead magnets I have created. Go figure. My best advice is just to put something out there and accept feedback. Show it to your audience or current customers and get their reactions. If you aren’t sure if your lead magnet is performing well, create a second lead magnet for comparison. At the end of the day, producing a lead magnet that cuts through the clutter is all about deeply understanding your customer, accepting feedback, and iterating until you get something that works. 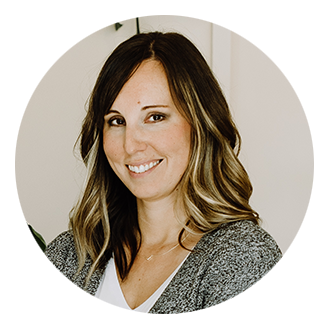 Molly Marshall teaches small business owners and online entrepreneurs how to systematically and simply grow a profitable online presence through social media. 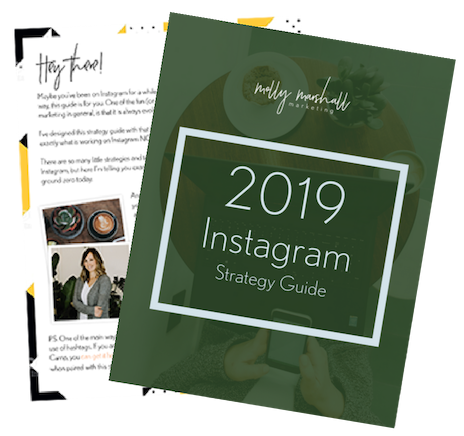 Get your FREE 2019 Instagram Strategy Guide now! Awesome Molly. Thanks for this. Great article thanks so much! I have an online course for business owners to make videos with their smartphones…I’ve already created a leafmagnet (video) about how to film your online course or vlog but now wondering if it’s too broad? Maybe 3 top tips for being natural on camera? Or 3 videos you can make without being on camera? (For the peeps who can’t stand the thought?). I agree with you – I would definitely go more narrow on the lead magnet – both of those ideas are fantastic… go with either! © 2016-2019 Molly Marshall Marketing. All Rights Reserved.